Sylvia started her insurance career in 1966 with the Aetna Insurance Company. Within a year she joined the independent insurance agency system as part of The Tankard Company and has worked as a Personal Lines Account Manager ever since. She joined Fridrich, Pinson & Associates in 1990 when The Tankard Company became part of Fridrich & Associates. Sylvia is the longest tenured member of the FPA team with over 26 years of service. 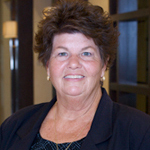 She has over 50 years of overall insurance industry experience. Her main responsibility is providing account management to customers with last names in the range of N thru Z however she also assists several long tenured clients of the agency. A lover of horses, camping, and the outdoors, Sylvia and her husband are proud grandparents of four.